So it's official. 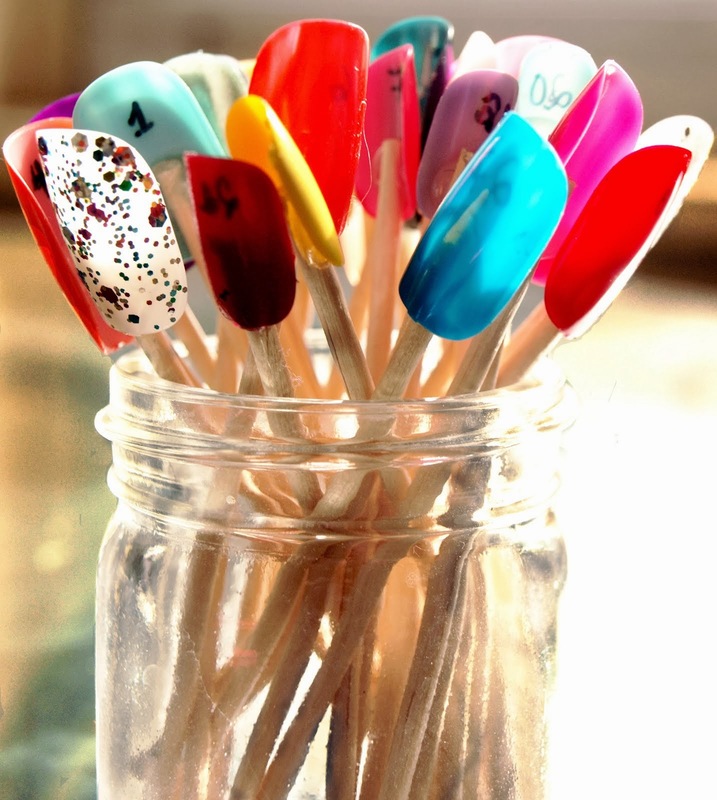 I am now clearly infatuated with all things nail related. I don't know how it happened really. Seems to have appeared all of a sudden... Just a little over 2 weeks ago I, WAIT. Backtrack to over a month ago. It's all coming into view. I was at dollar tree and just happened to go into cosmetic aisle. Who knows for what because I'm not into makeup much but perhaps it was the polish Gods (just joking here) drawing me towards my awaited, uncovered, waiting to burst open, destiny. Whew! That's a mouth full. :) It was in this aisle that I saw some beautiful colors before my eyes. Nail polishes by LA Colors adorned the shelves in neat little rows, packaged in such a way as to be desired by all who set eyes on them. I thought to myself, hmm,self, you haven't bought nail polishes for ages and the ones you have now are desperately in need of a proper trash can funeral. (Smile, it's funny. Visualize) So I began browsing the nail polish colors and bought a few, plus a makeup thing or two and moved on with life. Then and this is the leading to the WOW-o moment, I decided to paint my nails using one of the new pretty colors I had bought. I believe it was an LA COLORS (the dollar tree ones I referred to in previous paragraph) some shade of pink. As I gently coated my sad looking nails with pink goo smiles rose up in me like a well filled with rain water. I loved how my nails looked! But, and this is the best part, THE NAIL POLISH lasted a few days!! A Few days of extreme hand washes, clay contamination, film chemistry and more! THIS WAS HUGE for me. And WithOut base coat, top coat or any of the fancy jazz that I now realize are critical tools if I am to survive this nail polish journey. :) well that did it for me. I was hooked! I work with my hands ALOT. I am a studio art minor in college, currently taking ceramics and am constantly at risk of chipped, cracked, dry, krinkly hands and nails. That got me thinking on how I could prolong the life of the polish on my actual nails. That journey of research into the vast world of base coats, top coats, has ultimately led me here.